Despite the negative views of the United States expressed by many people around the world, the U.S. receives largely positive reviews for the way it treats its own people. 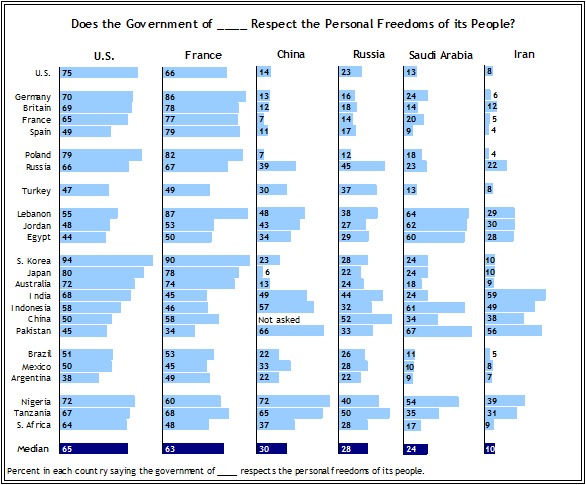 When respondents are asked whether the U.S., France, China, Russia, Saudi Arabia, and Iran respect the personal freedoms of their country’s people, the American and French governments generally receive the highest ratings. Across the 24 countries surveyed, the median percentage saying the U.S. government respects the freedoms of its people is 65%, about the same as the median rating for France (63%). The governments of China (median equals 30%), Russia (28%), Saudi Arabia (24%) and Iran (10%) on average receive lower marks among the more than 24,000 people surveyed. Majorities in 16 of the 24 countries surveyed believe the U.S. government respects the personal freedoms of Americans. This includes large majorities throughout the Western and Eastern European nations included in the survey, with one exception: Spain. Just 49% of the Spanish think the U.S. respects the rights of its people, while 40% say it does not. Ratings for the U.S. on this question are generally positive in Asia, especially in South Korea and Japan. Indeed, South Koreans and Japanese are more likely to say the U.S respects its people’s rights than are Americans themselves. The Chinese and Pakistanis offer more mixed assessments, although on balance the U.S. receives favorable marks in both countries. Consistent with their generally positive perspective on the U.S., the African publics included on the survey – Nigeria, Tanzania and South Africa – give the American government positive ratings for the way it treats its people. There is no country in which a majority says the American government does not respect the rights of citizens. However, more than four-in-ten in Jordan, Egypt and Brazil take this position. Argentina, meanwhile, is the only country in which the percentage of people saying “no” (46%) to this question surpasses the percentage of people saying “yes” (38%). Just as with the United States, majorities in 16 nations say the government of France respects the freedoms of its people. However, the percentage of people saying France does not respect these freedoms tends to be lower than is the case for the U.S. – the only countries in which more than 30% say this about the French government are Egypt (37%), Jordan (33%) and Brazil (32%). Overwhelmingly, their fellow Europeans believe the French government treats its people well. More than three-quarters of those surveyed in Germany (86%), Poland (82%), Spain (79%) and Great Britain (78%) believe the government in Paris respects the rights of the French people, as do two-thirds in Russia. The French themselves are actually more likely than any other European public to say these rights are not respected in their country – still, only 22% feel this way. Compared with the U.S. and France, the governments of China and Russia receive less favorable ratings. Majorities in only four countries think China respects the rights of its people. Meanwhile, China is the only country in which a majority say this about Russia (Russians themselves are almost evenly divided on this question). Throughout the U.S. and the European Union, large majorities believe individual freedoms are not respected in these two nations. More than seven-in-ten in the U.S., Germany, Britain, Spain, France, and Poland say the Chinese government lacks respect for personal liberty. The Russian government receives only slightly less negative evaluations. Views of the Chinese and Russian governments are mixed in predominantly Muslim countries, although overall, opinions of the Chinese government are more positive. This is particularly the case in the Asian Muslim nations of Pakistan and Indonesia, where China receives largely positive reviews, while many are unable to rate the Russian government. Elsewhere in Asia, the picture is different. South Koreans, Australians, and especially the Japanese take dim views of both governments, but hold particularly negative opinions of China’s rulers. Overall, the governments of Saudi Arabia and Iran receive even less positive reviews than do those of China and Russia. Majorities in just six nations think the Saudi regime respects the personal freedoms of its people, while majorities in just two countries say this about Iran. Assessments of both governments – and particularly of the Iranian government – are especially negative in EU countries and the U.S.
Attitudes toward Saudi Arabia and Iran vary across the Muslim world. In Turkey, few respondents think either government respects individual rights. In the predominantly Sunni Middle Eastern nations of Jordan and Egypt, about six-in-ten believe that Saudi Arabia, another largely Sunni nation ruled by a Sunni royal family, respects personal freedoms. On the other hand, only about three-in-ten Jordanians and Egyptians think Iran – a predominantly Shia nation – values these freedoms. Similar divisions between Sunni and Shia are found in Lebanon. Nine-in-ten (89%) Lebanese Shia believe Iran respects personal freedoms, compared with just 2% of the country’s Sunni population. However, Saudi Arabia actually receives positive evaluations from both Lebanese Sunni (77% respects personal freedoms) and Shia (89%). Christians in Lebanon tend to believe neither government shows respect for basic freedoms, although they are more likely to believe the Saudi government (36%) does so than the Iranian government (8%). The Christian and Muslim populations in Nigeria also have very different views of these regimes. Roughly three-quarters (76%) of Nigerian Muslims think Saudi Arabia values personal freedoms compared with just 32% of the country’s Christians. About six-in-ten Nigerian Muslims (61%) say this about Iran’s government, compared with only 17% of Christians. In Pakistan and Indonesia, both governments are generally seen in a positive light, although Saudi Arabia receives more favorable marks. More than six-in-ten Pakistanis (67%) and Indonesians (61%) believe personal freedoms are respected in the desert kingdom.